Perhaps you are familiar with the helicopter-like projectiles that are launched each fall from sugar maple trees. Those helicopters, formally known as samaras (Latin for elm seed), are the means by which sugar maples propagate. Shannon McCarragher, a Northern Illinois University graduate student, spent the past two and a half years examining how climate change may ultimately influence the germination of sugar maple seeds; an important consideration given the socioeconomic and ecological importance of this species throughout its range in eastern North America. To begin this research, Shannon gathered and purchased upwards of 34,000 sugar maple seeds from the northern, central and southern portions of the species native range. 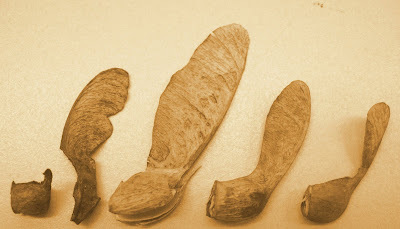 A portion of these seeds were then subjected to a series of laboratory growth chamber experiments designed to examine the response of seeds from these three, geographically diverse source regions to elevated temperatures; or, more specifically, how 1 °C, 7 °C and 14 °C increases above optimal germination temperature affect the viability of sugar maple seeds. The results from these lab experiments suggest that germination rates at 1 °C and 7 °C above optimal germination temperatures do not significantly vary across the three seed source regions . However, a 14 °C increase in temperature did prevent germination for the northern seed source, suggesting that temperatures can reach a level at which they cause local sugar maple extinction. And while this 14 °C increase in temperature did not prohibit germination for the central or southern seeds, it did suppress their germination rate considerably. Shannon also carried out reciprocal transplant field experiments that compared the germination and subsequent growth rate of seeds from the three sources that she manually dispersed into sites in Illinois (central) and Michigan (northern) . First year data collected from these field-based experiments showed that northern range seeds germinated at higher rates within the northern field site, but germinated at relatively lower rates in the Illinois site; suggesting that seeds from sugar maples current northern limit might respond unfavorably to climate change. However, second year data revealed that the northern seedlings, while initially abundant, also had the highest mortality rate and lowest growth rate at both the northern and central sites compared to seedlings derived from the central and southern seeds. The field-based experiments ultimately revealed that the seedlings germinated from the southern source seeds would likely survive a northward shift despite having initially lower germination rates. So why is this research important? Sugar maple seeds possess the unique characteristic of germinating most favorably at 1 °C under snowpack and, to date, it is important to know how the projected increase in the average global surface temperature (0.3 °C - 6.4 °C by the end of the 21st century) will affect the regeneration success of this important tree species. Therefore, studies are needed to identify environmental thresholds that are critical to sugar maple ecology.